He clearly snow coned the ball, which is a catch, his foot is on the bag, and Donald is half a step behind the play. He's clearly out. No doubt about this. So, what do we do now? Joyce apologized to Galarraga, cried, and hugged him. He even admitted, "I just cost that kid a perfect game." He's already taken enough ridicule from sports fans, sports writers, and probably Leno and Letterman are to follow. Jim Joyce has done everything in his power to remedy this situation, and I applaud him for that. That is all you can ask of the man for getting the call wrong. But, this leads me to a bigger question: What is the problem with Blue this year? The Umpiring this year has been horrible. From Joe West tossing 2 White Sox for the same thing, to Angel Hernandez calling the Rays' Shawn Rodriguez out for not touching 3rd when he clearly he did, this years umpiring has been atrocious. This is the worst I have ever seen it. Baseball needs instant replay now. All the other 3 major sports have it in some form, and it can save many a wrong call. Baseball only has it for homers. They need to expand it to everything but balls and strikes. With that, this call would have been reversed, and this mess would've been avoided. Even though baseball games are long, I would sacrifice 15 minutes for the integrity of the game, and for the right call. Lance Berkman's "check swing" on Tuesday night would have been correctly called, as he clearly went around, and that would have been the 3rd out of the inning, and the Nats would have won. Instead, Berkman hits a 2-run game winning single. Now, I don't think that the Nats will come close to cracking the postseason this year. But, what if they are close? This game could come back to the forefront. That bad call decided a game. That is why baseball needs instant replay now. It will save the game from the humiliation it's suffering now. The Tigers are treating the game like it was a PG, which is perfectly fine. GM is even giving Galarraga a brand new Chevy Corvette. But, is that enough to remedy the problem? Not a chance. There have been egregious calls in the past, in the World Series, that have decided champions. Bud Selig has said he won't reverse the call (which shows why he's a horrible commissioner), but baseball is looking at expanded instant replay and umpiring. This is the only way human error of the umps can be fixed. What if the NFL didn't have instant replay? The Patriots may never be as good as they became due to the Tuck Rule (even if it was a bad call), and Ed Hochuli would never have admitted his major mistake when blowing the whistle on Jay Cutler. If the NHL didn't have replay, "No Goal" may have never been recognized, and the rule for skate in the crease would be gone. The truth is, if this was in the 4th inning of a 5-5 game between Cleveland and Houston, no one would give a damn. 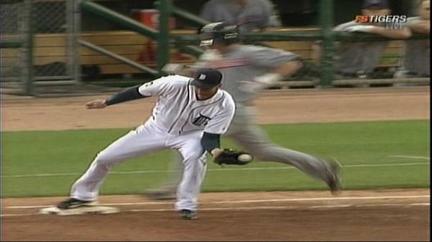 But, this took away history, and now officially at least, can never be rightfully given to Armando Galarraga. Bud Selig, here is the lesson to be learned. Instant Replay is necessary for baseball, not next year, not in August, it's needed now. What if another perfect game is taken away, what would you say then?